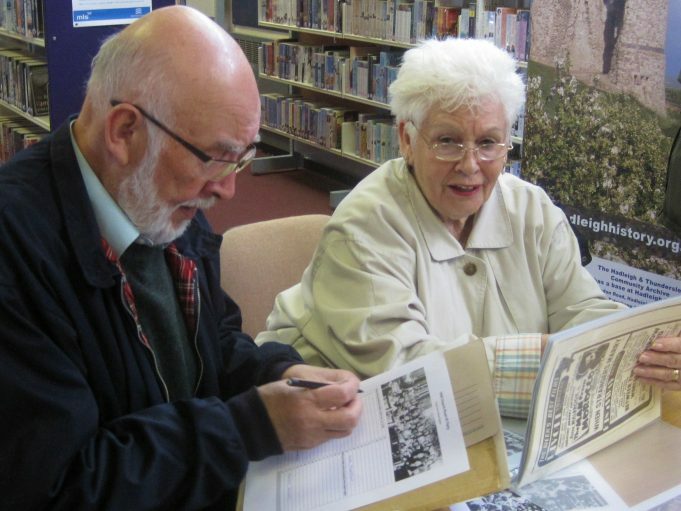 A big thank you to everyone who came to our special VE/VJ Day drop-in, on Saturday 11th May, at Hadleigh Library! There was a great atmosphere as old friends and neighbours met and tried to put names to the faces in our Victory Party photos. We had a new set of prints from the Church Road (near Seymour Road) party, and two ladies who were in the photographs came along. June (single name Hammerton) was at the Elm Road party, featured in our poster, and is seen above with one of our editors, Bob Delderfield, helping with names for other parties. Ash Road, Beech Road, Castle Road, three parties in Church Road, Elm Road, Homestead Gardens, London Road, Meadow Road, Oak Road and The Crescent. Some of the images are of poor quality so if you do have reasonable prints of the above parties, please contact us. We know from the Southend Times and Recorder that there were parties in Beresford Gardens, Arcadian Gardens and “The Woods” – it would be great if someone could bring us a photo for one of these parties, or any others. Of course, any photos we receive, would be copied and returned to the owner. Hadleigh Library has allowed the Community Archive to extend its display of party photos on the exhibition boards (near the window) for two weeks, to enable those who could not come last Saturday to see them. Please feel free to download the document below and print it, or send it to anyone you feel may be able to help with this project. In the 1945 Victory Party (I think it was Elm Road), we are the McCormick family from Castle Lane. No 10 is Kate, Pat (no 11), Jean (no 12), Mrs McCormick (Mrs Mac no 13), Barbara (no 14) and Mick (no 47). No 1 is Mrs Huggins, no’s 61 and 62 are Iris and Betty Fern. Hope this has helped to put names to faces. It was lovely to see my family and myself in this photo as I was only 1 year old and have never seen a picture of myself as a baby. Thank you so much. Update 20th July 2013 – we now have a V E Day party photo for the Castle Lane area and further contacts from the Meadow Road party.